Judging by the number of potential developers beating a path to Point Edward’s municipal office lately, there could be a substantial investment in the village soon. What’s all-but-certain is that Hamilton-based Vrancor Group will break ground in months on a $20-million Holiday Inn Express & Suites on Venetian Boulevard. It will be sandwiched between the Best Western Guildwood Inn, which Vrancor purchased last year, and the Hampton Inn by Hilton, which Vrancor opened in 2016. Company spokesman Peter Tosh wouldn’t say much about the market study that convinced Vrancor to locate three hotels in the same strip. But he did say most hotels in Sarnia and Point Edward run at about 56% annual occupancy with an average room rate of $107. Since opening two years ago, the 92-room Hampton Inn has run at 75% annual occupancy with an average room rate of $134. Point Edward is proving to be a good location for attracting corporate business during the week, and sports and leisure travellers on the weekend. That diversity gives Vrancor confidence in the market, Tosh said. 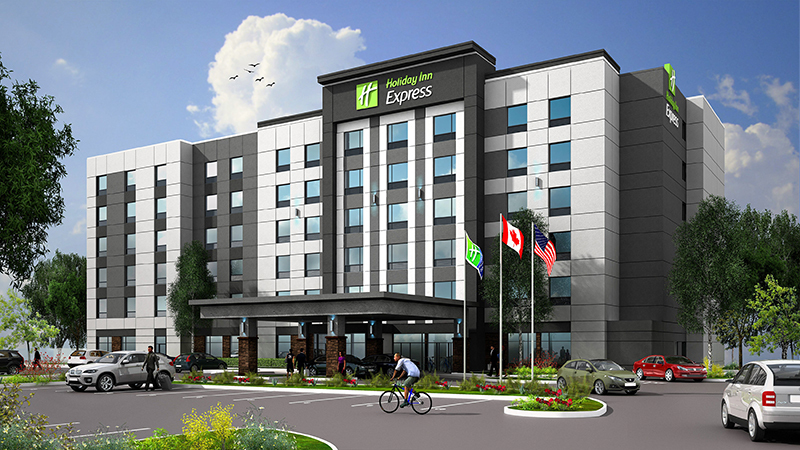 The new Holiday Inn Express & Suites is earmarked for land Vrancor acquired when it bought the Guildwood Inn. When it opens, the six-storey, 110-room hotel will create 22 new jobs. Before deciding to build another new hotel, Vrancor looked at purchasing the existing Holiday Inn on Venetian, Tosh said. “It’s a very old property and it doesn’t have a good design or layout. Vrancor has obtained a franchise licence agreement with Holiday Inn for the new hotel, Tosh added. Vrancor has already started pre-consulting work with planners, surveyors and engineers but still needs to submit a site plan to the municipality. There’s not enough room on the property to meet parking requirements, but village CAO Jim Burns said a minor variance should solve the problem. Burns has also had numerous meetings with speculators asking about four tracts of land owned for some time by Steeves and Rozema. Twenty-six acres currently used for the Holiday Inn’s nine-hole golf course is on the market, as is another 30 acres or so on Exmouth Street across from Cargill’s grain elevators, another 1.35 acres on Venetian, and a 5.5-acre site near the casino. There’s been talk of large, single-family residential developments, condo projects and possibly some commercial space built on those lands, Burns said. For instance, the golf course is on a flood plain and any development would be subject to approval by the local conservation authority. “All of this is exciting,” says Mayor Bev Hand. “Of course, I’m happy to see the hotel but we also want to see some new population. “People tell me all the time they want to move to Point Edward but there are no houses to buy. “There was a shortage before the Nova announcement and the housing market may have become even tighter since,” Hand said. Got a great business story? Send it to cathy.dobson@thesarniajournal.ca.